Produced from November through December 1941, with a total of only 12 vehicles built. The Sturmpanzer II saw combat in North Africa. It uses the same gun as the Sturmpanzer I Bison, though it correspondingly has 1.5 times more shells and a better rate of fire. Despite looking significantly different from the Sturmpanzer I Bison, the Sturmpanzer II has many of the same statistics. The extremely narrow horizontal arc and unimpressive range make it necessary to move this vehicle a lot, which can be annoying due to the long aim time as well as making easier to spot. But these only balance the vehicle as the gun is extremely powerful, capable of doing very large amounts of damage to even some tier 6s. Decent accuracy, at least at the ranges you'll probably have to be firing from. Although Additional Grousers are available for this vehicle, the additional 1,000 kg on its meager engine slows it down more than the Additional Grousers help, making their purchase pointless, in this case. When fully upgraded, this SPG can reach decent max speeds to reach their firing position much quicker than the Bison, though its traverse speed is a major handicap. Its traverse speed and slow reload time also makes it extremely vulnerable in close quarters fights, making support or excellent positioning essential. With highly trained crew members and a medium-caliber artillery shell rammer, this SPG can get a much faster reload rate than without. The crew training also significantly decreases the aim time. When combined with the great damage and penetration of the more expensive 450 damage HE ammunition, with a 30 round carry capacity, this SPG can be a very dangerous foe and can often do more damage than any other SPG on the battlefield. When facing high speed tanks, it is recommended one takes a very large lead on the target. Ideally, this SPG should not even attempt to hit these targets as hitting the right location at the right time with this SPG is very difficult when having to turn the SPG frequently. When facing lower speed tanks that are moving, it is recommended to center the tank facing the targets and then lock the track. Otherwise very minor adjustments of the aim will often result in very large aiming penalties. Of note is that the ammunition is highly effective against the sides of the KV-1S, with reliable 400 damage hits. First research the Büssing NAG L8V/GS 39 engine. Next research the upgraded suspension. Lastly research the FuG Spr. A radio. Even before the Sturmpanzer I entered service, plans were made to develop an improved version based on the PzKpfw II's chassis and components. Panzerkampfwagen II became obsolete in 1941, but the large number produced made it a perfect base for conversions. The first improvised prototype was tested at Kummersdorf on June 13th of 1940. In October of 1940, Alkett completed the first prototype based on Panzerkampfwagen II Ausf B's chassis, but did not provide adequate space for the large gun as well as its inability to absorb the recoil. On February 18th of 1941, it was decided to built Sturmpanzer II on modified and turretless chassis/hulls of Panzerkampfwagen IIs. In July/August of 1941, the first Sturmpanzer II Bison (lenghtened version) was produced. By January of 1942, a total of twelve (versuchserie - trial series) were produced by Alkett; 7 were produced in 1941 and 5 in 1942. The chassis was slightly widened (by 32cm) and lenghtened (by 60cm) in order to make room for the gun, and an additional sixth roadwheel was added. For a vehicle being based on the Panzerkampfwagen II , it had few components in common with the base tank variant. It was powered by a Bussing-NAG engine instead of the usual Maybach. Unlike the Wespe, there were no protecting sides along the entire length of the superstructure. A 150mm sIG 33 L/11.4 heavy infantry gun was mounted in the shield that extended straight across the full width of the superstructure. The gun had a range of 4700 meters and could be elevated vertically by 75 degress. The main armament could be used as a heavy infantry gun or as a heavy mortar, depending on the elevation and initial speed of the projectile. Sturmpanzer II was operated by the crew of 4 (commander, two gunners, and driver) and it weighed approximately 16 tons. Its performance was poor as its weak engine overheated and the vehicle had poor maneuverability. All vehicles were grouped into the 707th and 708th sIG Kp (Sfl.) heavy infantry gun companies and were shipped to Libya, North Africa, from February to April of 1942. They proved prone to constant mechanical breakdowns, and only a few were operational by using other ones as sources for spare parts. Eight were lost by December 2nd of 1942, while six others served with DAK - Deutsches Afrika Korps until the spring of 1943, when last of them was eliminated (abandoned). It is reported that the British captured six abandoned and dismantled Sturmpanzer IIs in one of Germany's workshops. 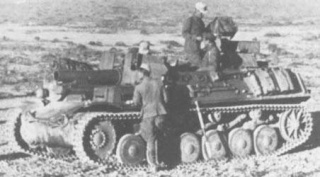 It is also reported that a single Sturmpanzer II was pressed in service by the Egyptian Army and saw combat once again in the war with Israel in 1948. 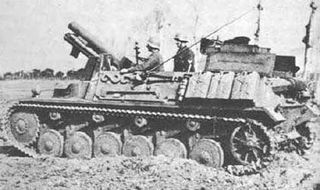 Based on experiences with the Sturmpanzer II, the more practical and successful Wespe was developed and produced. This page was last modified on 23 August 2014, at 03:23.